A healthy bra is a patented design bra with no under wires, stays, gel or padding that combines comfort, support with elegant styling, giving you a garment that makes you feel and look your best while directing your breast tissue properly. The "healthy" part is reinforced through the findings of a Professional Postural Therapist. We know the body to be designed to allow for a multitude of functions to keep us alive, moving or standing on two feet. However, lifestyle, diet, profession, repetitive motions etc. all contribute to how well the human frame is supported in gravity. The more stress on the frame, not properly offset by functioning postural muscles allows for a slow collapse forward and down. This affects the proper functioning of the spine (bones, muscles and nerves), the communication network (nerves), the body's energy and waste removal systems (blood and lymphatic circulation and the body's life force (the breathing mechanism; the diaphragm). Weak structural support is epidemic. For the support of the breasts, women have the "bra" if they choose to wear one. Indeed a proper fitting can and does support the proper spinal alignment assisting the muscles in "remembering" what to do. Postural muscles get a sort of non-functional amnesia. They need stimulation to bring them back into action. As the bra supports the breasts and reinforces the proper postural alignment, it POSITIVELY effects the gravitational load or "stress" on the body. 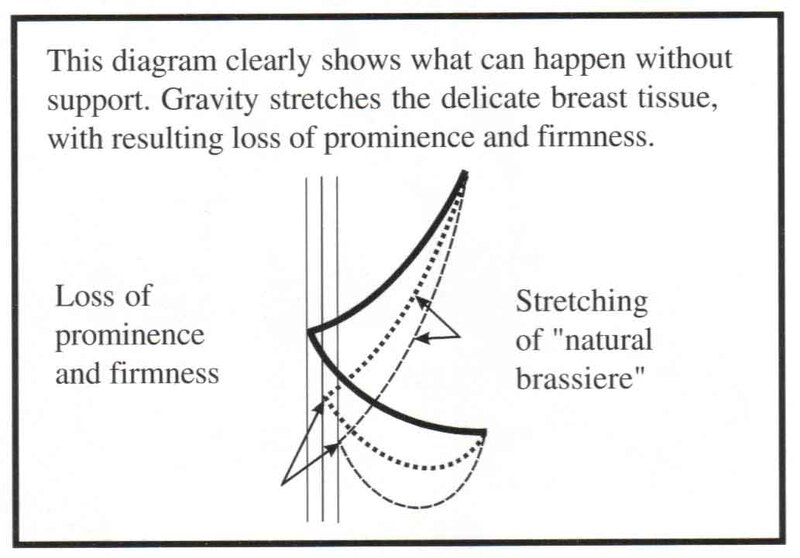 So a properly fitting bra can affect a host of "gravitational stress symptoms" such as muscle and nerve pain, rotator cuff injuries, osteoarthritis, poor circulation, poor lymphatic drainage, poor and limited oxygenation of the body. Who knew that these things could have any relationship to a bra! We are not recommending that women wear bras if they do not want or need to. (yes this is a website that sells custom-fitted bras) We are speaking to the hundreds of thousands of women who wear them who could receive all the awesome benefits that come with being fit properly and bringing your body into a more positive postural alignment. NO the healthy bra IS NOT being recommended in lieu of addressing the muscles that support the frame. It assists specially since the breasts have no muscle and rely on the chest and back muscles and the chest's ligaments for support. Gravity is not going away. Working against the pull of gravity is HARD, HARD work. When your body is balanced within the line of gravity the stress is amazingly offset. But most people have not felt this for a very long time. Even kids these days are starting their lives with unnecessary structural stress due to their genetic inheritance. The secret of the patent design is a Banderin™ shelf that positions the breast tissue while also enhancing proper postural support enhancing proper circulation and lymphatic support. This is a HUGE breakthrough in garment design. It is not what it IS doing, it is what it is NOT doing. This garment does not inhibit the natural body's processes. One key element to mention is the body's ability to remove it's toxins through the lymphatic system. It has been well researched, that trapped toxins within the body contribute to a host of health concerns. But did you know that trapped toxins add to a sluggish internal environment, a poor functioning system and the body holding onto waste that it should be able to relinquish? This is part of the constitution of excess body weight. When we think of being overweight, we think of being overfat. That is only part of the picture. Many overweight individuals carry a great deal of excess in the form of fluid, toxins and other waste products that are NOT just a matter of FAT loss but a matter of regaining HEALTH and the proper functioning of this human machine - the body. Yes, your choice of BRA affects this weight maintenance system through it's tie to a proper functioning immune system. How Can I Get a Healthy Bra? First of all, YOU are unique. Your body shape is unique. Your breast size, shape and weight is unique. Your health issues are unique. You need a CUSTOM BREAST CONSULTATION and FITTING. Since 85% of bra-wearing women are wearing the wrong bra, you may count yourself as one of them. To request a fitting information or appointment Click here. The unique design, comprehensive measuring system and abundance of sizes ensures most women of the best custom fit (as opposed to custom-made). Women's stores, and bra and lingerie specialty stores generally carry universal sizes causing you to compromise your fit in some way because they do not carry "your custom size". Even if they do have an abundance of sizes, the proper fitting is critical. Even more important than that is the design of the garment. This makes all the difference in the world. Generally store bras offer support through the lift from the shoulder straps, the wire underneath or the tightness around so nothing moves. ALMOST ALL BRAS offer these support designs. Your custom fitting bra appointment brings you a highly skilled bra technician that will choose the bra that best fits the uniqueness of you. After she obtains your four measurements then she utilizes "bra math" to choose from the between 10-15 cup sizes that are available in your around (ribcage) size. Do not hesitate if you are considering a weight change or pregnancy. The unique fitting process also accommodates a moderate amount of weight loss/gain. There is also a special fitting procedure for pregnant and nursing mothers to accommodate the engorgement phase. Observing the laundering instructions is critical to the life of the garment as well as to maintain consistent fit through out the life of the bra. If you wear and wash the custom fitted bras according to instructions, they should outlast any department or specialty store bras 4 to one. Copyright © 2002 The Healthy Bra Company All rights reserved.